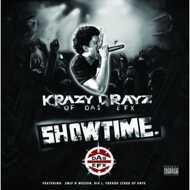 Smoke On Records presents the vinyl edition of Krazy Drayz’ 2012 CD only album “Showtime”. Andre Weston better known as Drayz or Krazy Drayz is one half of legendary Brooklyn hip hop duo Das EFX. “Showtime” features Black Rob, Dres, Fredro Starr and Smif-N-Wessun.